2018 is drawing to a close, and frankly I’m all right with leaving it all behind. But as you count down the minutes to 2019, keep this in mind: Thirty years have passed on alternate Draenor since we defeated Archimonde and saved everyone, and Lantresor is still carrying around a mining pick. I guess he learned to appreciate his garrison assignment? Regardless, let’s wrap up the year and answer your questions, because that’s what we do here! Q4TQ: Has there been any further discussion or tinfoil hats about the ramblings of Il’gynoth, Varimathras, and Ogmot from Legion? Seems like we still don’t have a good idea of what many of their quotes refer to. There were a few people wondering if he was talking about Jaina, but I think he was talking about Sylvanas in both instances. Sylvanas is doing what she can to splinter the Alliance, but the implication here is that she’s been working at this for a while now — as in, potentially before she became Warchief. I’m still combing through what she’s been doing in the background of pretty much every expansion to date, but I’m guessing, judging from the whole ‘thrones run red/holy places burn/shattered mask’ bit, that we haven’t even begun to see the full scope of whatever she’s planning. This is something we’ve been continually bringing up on Lore Watch, however — if you haven’t been following along with those, you might want to give the latest episodes a listen, including the one that drops today. D&D QftQ: While reading up on races, it’ll say “All [race] do this, and always react this way…” What’s up with that? Why would every character in a race act like all the others? Doesn’t that take away from RPGing? All actions and everything set in advance, once the race is chosen? Can players and the DM choose individually how PCs and NPCs act? I know this isn’t technically a Blizzard question, but I can tie it back to roleplaying in WoW fairly easily, because the concept is similar — you’re being given a template. You’re free to make your character act however you’d like to act, but you’re also being given the building blocks of general understanding of each race. That way you’re aware if your character is acting in a way that’s out of the ordinary, and you know you’ll need to develop a story for why they act the way they do. To tie it back to WoW — the Draenei are known as followers of the Light, they’ve been fleeing the Burning Legion for thousands of years under the guidance of the Naaru. So what if you make a Draenei that doesn’t like the Naaru? You’re perfectly free to do that — but since it kind of flies in the face of established lore, that’s something you’re probably going to have to have a good explanation for. When you create a character, you aren’t writing the whole of their backstory, you’re just putting together a general idea of it. Having some kind of pre-established ‘this is the way things are’ means that you have somewhere to focus that development, and have some answers ready and at hand for any questions that might pop up. Plus, it also gives the DM a pretty good framework for how NPCs are going to react to your character. You aren’t the only one roleplaying at the table, after all! Q4tQ: Has anyone figured out what kind of nudge populates the visible emissaries on your map on log-in? It’s really annoying that they be blank for a LONG time after logging in when I know they should be visible, and /reload doesn’t work! Are you logging in before the server rolls over and introduces new Emissaries for the day? I know I’ve logged in and had blank spots before when I was pretty certain there should be one available — and it turned out I logged in before they kicked in. If I remember correctly, it happens at 8am Pacific — so if you’re east coast, that’s 11am for you. If that’s not the case, I’d say try switching zones. Head through one of the portals in your capital city and then turn around and go back again — probably taking the Silithus portal is your best bet, because there’s a return portal right there. I don’t think I’ve ever run across this issue outside of just logging on too early for the reset, though! Do we have any reason to believe that Azeroth will “hatch” in our characters’ lifetimes? Nope! We don’t actually know how long it takes for a planet to go from…you know, egg, to full-fledged Titan. But you have to remember that the Titans are super long-lived creatures — the last thirty-odd years of history on Azeroth since the opening of the Dark Portal? That’s like…the span of a breath to them. It’s an impossibly short period of time. I mean, you think the Draenei are long-lived, or Tyrande and the other Night Elves that date back to the War of the Ancients 10,000 years ago — that’s nothing compared to a Titan’s lifespan. And we also don’t really know what stage Azeroth was in when Aggramar found her, or how long she was out there floating in the Great Dark. Since we’re kind of blind to the whole idea of a Titan’s gestational timespan, there’s really no way to answer that question. But I’d say it’s likely all our heroes will be long dead and gone before Azeroth actually decides to “hatch” and wake up. Well…yes. I mean, the song was crafted by the people of Kul Tiras after Daelin’s death. 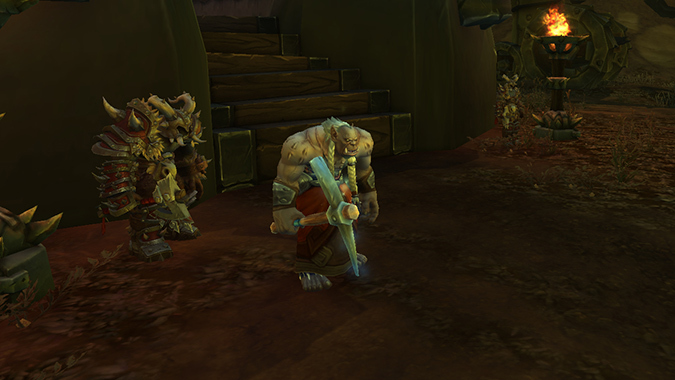 Keep in mind that during that time period, the only news Kul Tiras had of Orcs was from the First and Second wars, during which time they were still completely under the thumb of the Burning Legion. They were the Old Horde, the ones that drank Mannoroth’s blood — and that blood curse gave them green skin, glowing red eyes, and an insatiable bloodlust. Demon blood and all, it’s not exactly going to have pleasant side effects. Another fun note to make — judging from Jaina’s flashback at the beginning of the Alliance journey to Boralus, these weren’t even the original lyrics to the song. It appears to have been some kind of lullaby or shanty that Daelin sang with his daughter. If that’s the case, then the song is kind of a double-hit to poor Jaina — it’s a beloved childhood tune that was re-written to change the titular figure — her — from a treasured child to a traitor and murderer. So Tempest Keep Kaelthas, Do I have to loot the weapon things to start the last phase of the fight? Nope — you just have to wait. That whole fight is on timers, and even if you murder everything very, very quickly, there’s still a timer and some speech to wait out. There are a few older fights like this, and while it might be kind of annoying now, it was great back then. You had a little time for people to grab the appropriate legendaries, heal up, take a little breather if you could manage it before the chaos amped up in difficulty. Now it’s just some extra time to twiddle your thumbs and hope that Kael drops a mount! QFTQ: do you prefer raid fights that have multiple phases, lots of mechanics, and things you need to be aware of, or do you prefer more straightforward “tank ‘n spank” fights where the boss’ strength is the greatest challenge to the fight? It…well, it depends. Back when I was still raiding regularly, I loved the tank n’ spank fights because as melee I could just sit there and buzzsaw through the bosses’ health with little regard for movement. A boss that moves around a lot is a boss that is decidedly harder to stick to, which meant my DPS took a hit. But that’s speaking as a Rogue. On the other hand, as a player I really loved the fights that had multiple phases and mechanics in place. Sure, they were a pain to figure out — Razorgore took us forever to nail down in vanilla — but once you figured it out, they were a delight to see in action. Sort of like a gigantic puzzle just kind of falling into place and elegantly unlocking itself. Bonus points if there was some kind of lore exposition in the middle of everything! That’s it for today’s Queue — and for the Queue in 2018! On that note, I wanted to take a second and thank you guys for reading and leaving comments and being silly and generally just being you. 2018 was pretty much one of the hardest years in my life on a personal level, and having this space as a continual sunshine spot of levity helped tremendously in getting through it. Heck, it always makes my day a little better. Hugs for all — and remember, if you have any questions you’d like to see answered, be sure to leave them in the comments below!